Today I want to talk about a nice formalism of quantum mechanics developed by Samson Abramsky and Bob Coecke. The underlying mathematical formalism is that of category theory. The pictorial formalism describes systems and processes. The best analogy (with very good reason) is with computer science. There FORTRAN was one of the earlier languages of functional programming. In Fortran one writes functions which take an input, perform some transformation (does a computation) and generate an output. 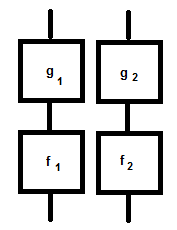 One can formally represent such a program with a box connected by two wires: the input and the output. From a high level perspective it does not matter what goes on inside the box. More important than the inner workings is that those functions can be executed one after another and can be combined like Lego to generate complexity. Similarly in the pictorial formalism one encounters linear transformations of the wavefunction and those transformations can be combined for complexity. What makes it all interesting is that one can operate simultaneously on several inputs (like on two particles in a singlet state), or on parts of composite quantum systems. 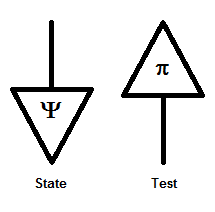 The combination of a state followed by a test gives you the probability. 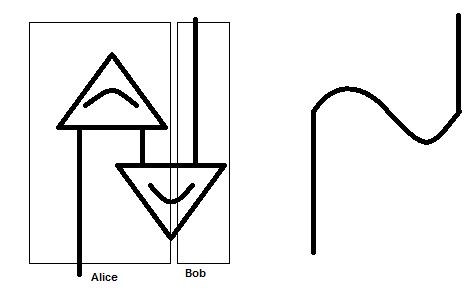 Alice shares with Bob a Bell pair (the bottom triangle which represent a state) and Alice performs a bipartite measurement on the qubit to teleport (the leftmost line) and one of the Bell particle (the upper triangle). 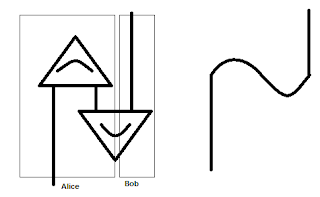 Then she transfers a classical bit to Bob who can use it on his half Bell pair particle to recover Alice's original qbit. The information flow can be continuously traced as in the line on the right. Sometimes the information seem to flow from the future to the past, but the line can be deformed by pulling the ends to straighten it and restore the causal order. 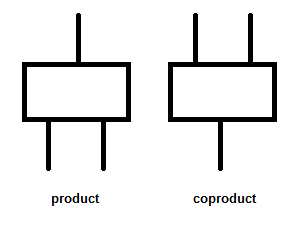 My poor drawings in Paint do not do justice to this very powerful method to represent the information flow. In explaining this approach I have a major weaknesses: I do not know the latest standardization of symbols. However I understand that a book on the pictorial formalism will soon become available and this will clarify the notation. In the pictorial approach complex quantum computations becomes child's play. 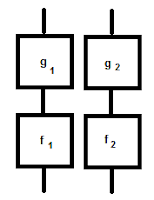 One can even compare this method with Feynman's diagrams in terms of simplification of computation. Because quantum mechanics is universal, it applies just as well to single physical systems and to composite systems which are represented using the tensor product ["while", \(\otimes\)]. 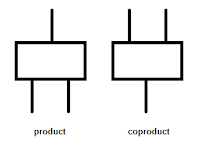 It is the interplay between products, coproducts and the tensor product which completely determines the algebraic structure of quantum mechanics. All I need is a basic starting point: a product which appears naturally. And this is the Leibniz identity which comes out of the fact that the laws of nature are stable and unaffected by the passage of time. In the infinitesimal case this generates the Leibniz identity which is nothing but the good old fashion product rule of differentiation. Two mathematical representations of this product are the commutator and the Poisson bracket and they correspond to the quantum mechanics Hilbert space and phase space formulations. But I will talk more about this in future posts. "Has use of this pictorial/categorical formalism led to any new results? (as Feynman diagrams certainly did)"
I do not want to reveal without permission the identity of the person who asked this question, but I want to give here an extended reply which was not possible under Twitter's insane character limit. My answer is that the pictorial formalism did not led to new results (as far as I know) as this formalism is strictly a reformulation of the Hilbert space formalism and what you can do in one you can do in the other one. The categorical approach proved its usefulness in quantum mechanics reconstruction in explaining why the results were the way they were, but this was hindsight, an "aha moment". The original motivation came from a very different direction: the attempt to find a common axiomatization for classical and quantum mechanics. On Feynman diagrams I am not sure what were the new results which came from it. And here is why I say this. When I was in grad school studying QFT from Mandl and Shaw, the professor did not follow the book for the first half of the semester but instead he forced us to use non-relativistic pre-Feynman diagrams, just to appreciate what Mr. Feynman actually achieved. The non-relativistic diagrams were painful to compute, and you have like 16 non-relativistic diagrams for one relativistic Feynman diagram, but you can actually do exactly what Feynman diagrams could, just with a lot more work. I had the same question as this person on Twitter, i.e. what is the real utility of pictorial representation? I am willing to accept that this may be an early stage. So we have to wait! But to calculate any observable, you have to write the full Hamiltonian and calculate matrix elements or solve Schrodinger equation anyway. Does this approach make numerical evaluation easier or combine various matrix elements to give one grand answer? As for utility of Feynman diagrams, I would say that once you have Feynman rules, you do not have to go back to Lagrangian every time you want to evaluate a higher order diagram with lots of loops etc. Although I never evaluated any Feynman diagram numerically, my guess is that such rules make numerical evaluation possible and easier. What do you think? I may be biased, but I see a very bright future for this approach and I think it is premature to pass judgment at this stage. Conceptually category theory is the right paradigm for quantum mechanics and at least it helped me to validate my approach and understand why and how it worked. When you are exploring a brand new area, there is a lot of confusion and wrong steps, but category theory lifted the fog and now I can attack with clarity new problems. (The pictorial formalism is simply a way to visually represent categorical arguments). On Feynman diagrams I am not an expert in this area of numerical simulation and my answer is that I don't know. 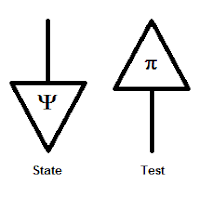 I know there are powerful symbolic software packages which compute Feynman diagrams exactly, so I don't quite see the need for numerical methods. Mathematica was started by Stephen Wolfram to help with his Feynman diagram computations (I heard him give a talk at UMCP about it). Thanks. OK! So we will wait! BTW, by numerical methods, I did mean computational software in contrast to paper and pencil! What does Choy-Jamilkowsky isomorphism imply with respect to your tensor product formalism? Also this seems to work with bipartite entanglements. What about tripartite, W and GHZ entanglements? I think one needs to extend this into a C* algebra. I do not use the channel-state duality in my case as invariance under composition has 3 solutions: QM, CM, and hyperbolic QM. In hyperbolic QM one does not have completely positive maps. C-J isomorphism arises only after introducing positivity as another physical principle. The interesting problem is to find out what happens beyond C* algebras, in the realm of Hilbert modules (where we have QM over SL(2,C)). And I don't yet know the answer to this. Hi Bob, nice links, thanks. Can I ask you a favor? Can you drop a quick message here when your book becomes available? This is a new word for me, hyperbolic QM. Can you explain its basics in few lines? Is it QM where you do not mind if probabilities become negative? Hyperbolic QM was originally discovered by Andrei Khrenikov, and re-discovered independently by Emile Grgin. In a nutshell you take ordinary QM and replace complex numbers with split-complex numbers (where instead of i = sqrt(-1) you have i=sqrt(+1) but i is not 1) https://en.wikipedia.org/wiki/Split-complex_number. This solution is stable under composition, but is nonphysical because the position and momentum representation give you distinct predictions. Moreover I was able to show that you encounter negative probabilities in this theory and there is no physical interpretation.